Canadian Wildlife Federation: Q. There is a mother duck crossing the road with her ducklings. Is there anything I can do to help her? Q. There is a mother duck crossing the road with her ducklings. Is there anything I can do to help her? A. It really depends on what type of road you are on and how busy it is. The main thing to keep in mind is to never put yourself or others in danger. I know it’s hard to resist those cute little ducklings but public safety has to come first. If you’re on a highway or a busy road - do not stop. Even swerving is a no-no as it can cause you to lose control of your vehicle. In these situations it is best to get a passenger or use your Bluetooth to contact a local wildlife rehabilitation centre or local police. If it means preventing an accident, they may get involved. If you are on a less busy road and no other cars are around, you can slow down and carefully go around the ducks. 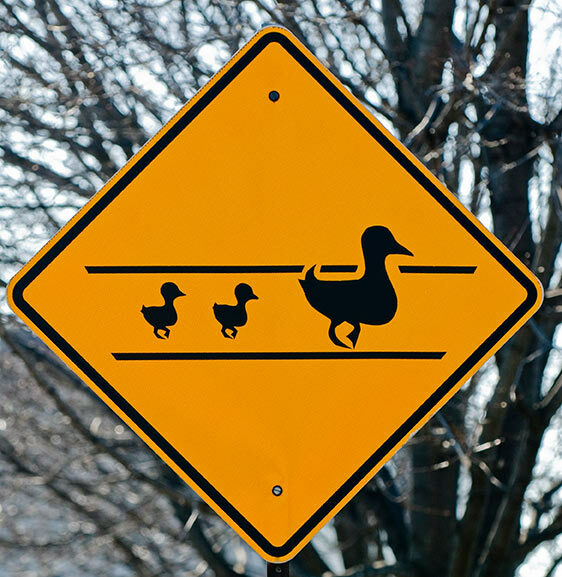 Or, if you can safely pull completely off the road, you could try to carefully guide the ducks off the road in the direction they are heading. But again, your safety and the safety of others is your responsibility. You never know when a driver will come around a bend, possibly driving too fast or distracted. If your actions cause an accident, even if you are trying to do a kind gesture, you can be charged. That female duck knows exactly where she wants to take her ducklings. She has a river, lake, pond or another water body in mind. Sometimes by helping, despite our best intentions, we can actually complicate the situation further. The ducklings can become separated from their parents as one flies off or we can cause them to run into traffic. If you are familiar with this area and every spring it is a common crossing for ducks, you could see about getting a road sign put up. Talking with your city councilor is the first step in seeing about a duck crossing sign. What should I do if I see a moose while I’m on the road?